It is considerably a demand to know how the credits and refunds gets adjustable during the final summary when federal tax payers file their Form 2290 for multiple vehicles. For example, if the final figure exceeds the amount that the tax payer holds right then, he can pay it later or can add the other vehicle which has some refund. 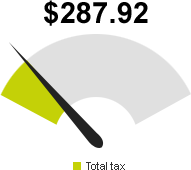 Tax Meter foretells your closing digits and helps you take right decisions. Tax2290’s tax meter is a free e-file feature that makes all your tax calculations at instance while filing Form 2290. It is available in all pages of our application at the top right corner as a plug-in unit which reflects the figures calculated by the tax engine depending atop the input details on our web pages to file Form 2290. It counts your refund tax, total tax, credits altogether and summarizes your balance due straight away. This tax meter is applicable for all federal tax payers who have single number of vehicles to ‘n’ number of vehicles. As and when you enter your vehicle information like the VIN etc, our shrewd application calculates your tax at the background and displays it for your reference. You get to know how much tax you owe to the IRS for free. Means without any payment to either the IRS or to us while you have to pay only when you either print your filled form 2290 or when you transmit the same to the IRS via our application. About Us: Easily E-File Internal Revenue Service (IRS) Road Tax Form 2290. Get Instant Schedule 1 of Form 2290… only at Tax2290.com. Tax2290.com is the first Internal Revenue Service (IRS) authorized online service provider to E-File IRS (Internal Revenue Service) Road Tax Form 2290 online. We are an entirely web-based provider for filing IRS (Internal Revenue Service) Road Tax Form 2290 online and we also provide clear Form 2290 filing instructions. We provide 24/7 customer service & Form 2290 filing instructions through email and chat. E-file your IRS (Internal Revenue Service) tax Form 2290 online and get your IRS Road Tax Form 2290 schedule 1 copy with a watermark stamped within minutes. Get started now with us and Tax2290.com will guide you through the process to E-File IRS (Internal Revenue Service) Road Tax Form 2290 online.